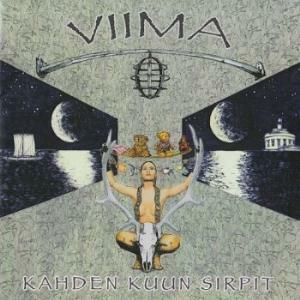 Viima releases in 2009 their second album, Kahden Kuun Sirpit (Two Crescents), with a new lineup in which only two members are left from the previous album. The new people in the band are drummer Mikko Väärälä, vocalist flutist and saxophonist Hannu Hiltula and bassist Aapo Honkanen. Continuing from the first album is keyboard player Kimmo Lähteenmäki. The album contains four songs, one instrumental piece (Sukellus) and an epic title track. This title track is about the history of the city of Turku (where the band rehearses) and also about an individual's life in the city. As the band sings in Finnish, it is a welcome gesture that the booklet has translation into English of the lyrics alongside the original Finnish version. We start with Autio Pelto which resonates the sound of the previous album with its charming flute in the foreground and the guitar backing it up while the keyboards administers a soothing background base line to support its "comrades". The folk elements are still here (though to a lesser extent than the previous album) continuing the "sympholk-prog" style of the previous album, though this time it sounds less cheerful than before, but as rich sounding. Gone are the female vocals of Päivi Kylmänen and enter the male vocals of Hannu Hiltula. This is to me unfortunate as I thought her vocals were superb and gave much life and vitality to the music. It could have added a great deal here, supplying another layer of delightful vocal layer to the mix. Hannu's vocals, while doing the job well, are in places somewhat weak, as in the last song, the title track Kahden Kuun Sirpit (around the two minute mark, where he sings almost without backing instruments but as for the rest of the song it's fine). But overall, he does a pretty good work. In addition he does a fine work playing the flute and saxophone. The music is beautiful and emotional-sounding; it is not over the top and doesn't get too sophisticated but it is sufficiently intricate and very captivating to have me listen to it attentively and repeatedly. One point where it gets quite dynamic and thrilling is in Unohtunut, towards the end of the fifth minute where a lightning effect springs in and the guitar gets more vocal than usual and yet even here restraint is noticeable as the pace doesn't pick up and they could have gone for a very loud segment, but instead remain faithful to their style. Not to say they don't get loud enough; certainly there are peaks in the music and high points reached but these climaxes sound carefully controlled to me. On a different note, Viima continues to provide attractive melodies and develop them nicely, shifting slightly to introduce it from different sides, adding layers to it in the form of playing it differently or adding instruments. A good example is the third track Sukellus. This track, an instrumental piece, has a gorgeous transition in its middle and on the other side it becomes another gorgeous theme in which the saxophone played by Hiltula has a spellbinding lead line, which is then picked up by the guitar. This track reminded me of Camel for some reason (as did parts of their previous album); perhaps the way the guitar is played and its mellow sound and the soothing effect the music has on me. The title track, an ambitious piece of almost twenty three minutes shows Viima's strong 70's symphonic prog influence while introducing elements of fusion alongside what some might call "experimental" approach, but to me is them trying new ways to enrich their sound (this is only found in the beginning of the song). This song also features a string quartet that adds to the attractiveness of this piece. The song becomes minimalistic sounding at times with a few instruments playing at the same time. I feel that here a combination of vocalists would have done wonders to make this sound better: a high-pitched vocalist and a low-pitched one. But aside from that, the music itself is magnificent; going from quiet and as mentioned minimalistic sounding, to rich and surrounding. This piece requires repeated listening to absorb it all and to follow its multi-part structure. Overall, it's a fine accomplishment, but I wish there were more dynamic and faster segments in here. As for the music itself, the melodies are, as usual, compelling and spacious and the musicianship as good. The climax at minute twenty one is highly emotional and evocative. This is one thing that Viima excels at. A fine album that I enjoy listening to and come back for more; different somewhat than the previous one, but carries on with many of the elements and sounds found there and builds on that to create a new listening experience in this album. Gorgeous melodies are abundant, beautiful instrumental passages, rich sounding and day-dream inducing. Recommended.